So this morning, Ee asked me to help her take out a toy McDonald’s cash register that my mother-in-law had given her. My mother-in-law has bought the kids like four cash registers, all complete with annoying sounds. Anyway, when I picked it up off the shelf, the thing rattled, which was unusual. Upon closer inspection, I found all the missing spare keys that had disappeared from the junk drawer recently. Somebody’s kids are grumpy this morning. Manfrengensen and I went out last night, left two of them with a babysitter and took the other one to a moon bounce birthday party. We dropped him off and went for Mexican. Damn, those Mexicans can sure cook up some tasty vittles! I don’t necessarily fantasize about having a nicer house. It would be nice to have just a little more room though. And a basement that doesn’t breed cooties. In any case, I guess everyone went to bed too late and got up too early. I know I did. Ee brought her toy camera to me this morning. It has Buzz Lightyear on it and was, at one time, filled with candy. “Cheese,” she said. Then she went to her brothers and did the same. To me, she reported that she had “cheesed” them. 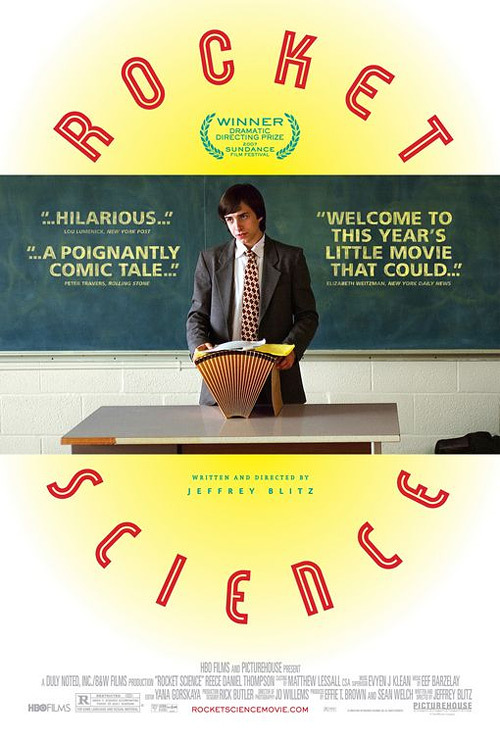 Manfrengensen and I watched this really great movie the other night called Rocket Science. A small, indie-movie about a stuttering teen who joins the competitive world of debate teams in order to win an illusive love, it was really cute, hilariously funny, and took us in a completely different direction than we expected it to. Highly recommend. Today I am retermined to go to the gym and not to get stressed about anything. Hey: I have those little monkey heads for my keys… glad to see you got the pics up and running!